"The most complete study so far of the elaborate multi-billion dollar propaganda machine that the transnational corporations have built up to discredit the environmental movement"
"Global Spin is outstanding. Sharon Beder has taken the taboo subjects of propaganda and censorship in free societies and exposed their insidious threat. This is such an important book that I would put it on every school curriculum"
"Shows the way for environmentalists to move from a position of political naivety and relative impotence to a new radical depth of understanding where corporate propaganda can be effectively countered. . . The most important contribution to the environmental debate that I have read." Included in "50 books to change your world", The Ecologist, September 2002. Global Spin reveals the sophisticated techniques being used around the world by powerful conservative forces to try to change the way the public and politicians think about the environment. Large corporations are using their influence to reshape public opinion, to weaken gains made by environmentalists, and to turn politicians against increased environmental regulation. 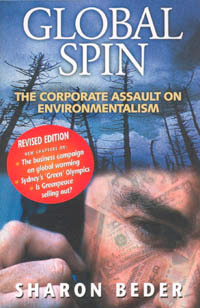 The corporations' techniques include employing specialized PR firms to set up front groups that promote the corporate agenda whilst posing as public-interest groups; creating 'astroturf' - artificially created grassroots support for corporate causes; deterring public involvement by imposing SLAPPS-strategic lawsuits against public participation; getting corporate-based 'environmental educational' materials into schools; and funding conservative think-tanks, which have persistently tried to cast doubt on the existence of environmental problems and to oppose stricter environmental regulations. In the media, corporate advertising and sponsorship are influencing news content, and industry-funded scientists are often treated as independent experts. In the shops, 'green marketing' is being used to reassure consumers that corporations are addressing serious environmental problems. Global Spin shows how, in a relentless assault on democracy and its institutions, the massive, covert power of large corporations has enabled corporate agendas to dominate the international debate about the state of the environment and the most effective means of solving environmental problems. Introduction: The first wave of corporate activism in the US; The war of ideas; The new corporate activism. Fronting for Industry: The corporate strategies of front groups. Manufacturing grassroots; Influence on politiciains; Grassroots: mobilising family, friends and neighbours; Manufacturing a mass movement. The Wise Use Movement: Wise Use philosophical underpinnings; Common Enemy: the environment movement; Enrolling the alienated and dispossessed; Strategies and tactics; Support from conservative and corporate quarters; People of the West! ; Property rights groups. Lawsuits Against Participation: The chill effect; SLAPPs outside the USA; Responses to SLAPPs. Conservative Think-Tanks: Corporate funding; Some conservative US think-tanks; Conservative think-tanks in other countries; Fostering think-tanks; Political influence; Long-term influence. Think-Tanks and the Environment: Casting doubt on the urgency of environmental problems; Paralysis by analysis; Free-market environmentalism; Resurrecting the market and reinforcing property rights. The Public Relations Industry: Large public relations firms; Public opinions and the media; Modern media techniques; Public relations and government; Public relations or propoganda? Public Relations Strategies: Communicating and cultivating trust; Emphasizing the positive; Getting environmentalists on side; Dealing with uncooperative environemtalists; gathering intelligence; Dealing with local residents. Scientific Controversy - Dioxin: Industry-funded research; Industry and EPA get together; Renewed industry public relations efforts; Latest EPA dioxin reassessment; The chlorine industry and its allies; Chlorine industry public relations; Reassessment responses. Advertisers - Getting Them Young: Targeting children; Targeting education; Infiltrating school lessons; Environmental education; Commercialism in education. Advertisers - Influence and Strategies: Green marketing; Influence of advertisers on the media; Television: promoting consumerism; Advocacy advertising; Proctor and Gamble; Consumer culture. The Media - Corporate Influences: Becoming the major source of the news; Winning over the journalists; Journalistic objectivity; Framing and presenting the news; Lack of diversity in news reporting. Reporting on the Environment: Reporting on dioxin; Ownership of the media: General Electric and NBC: General Electric as a responsible corporate citizen. Global Warming: Corporate-Sponsored Confusion: Front Groups; Scientists; Think-Tanks, Conferences; Economists. 'Greenwashing' and Olympic-Sized Toxic Dump: Selling Sydney; From rhetoric to reality; Media self-censorship; Selling a leaky landfill as the 'world's best practice'; Greenpeace's continuing role. From Green Warriors to 'Greenwashers': A solutions-oriented approach; The revolving door.